Socialisation of adolescent girls is often aimed at cultivating conformity and compliance with existing patriarchal norms. Mainstream education with its lack of attention to gendered societal inequality, does not adequately challenge patriarchal values. Feminist pedagogy recognises this and attempts to bring feminist theory into practice. In the first phase of Dhwanigalu, Prakriye started working towards bringing critical education into the grass-roots. Inspired by the feedback from the girls who participated in the training and the strides they made in their journey of empowerment, team decided to take the project to new geographic locations. The second phase of the project began in November 2017. 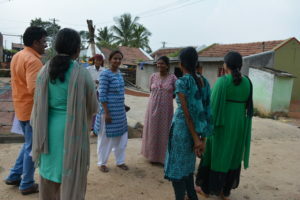 In this phase, the project was executed in four new villages in rural Mysore and a total of 102 adolescent girls are currently attending the sessions. Motivated by the success of the first phase, the Prakriye team was keen to reach out to as many adolescent girls as possible in the second phase. This made narrowing down the villages a tough task. The team finally zeroed in on the villages of Kattemanuganahalli, Jakkahalli, Naganahalli and Hirehalli. These villages were chosen as they were geographically remote and socio-economically backward compared to the other villages in the district. In Kattemanuganahalli, all the girls participating in the programme belong to marginalised social locations. Three factors played a major role in the selection of the villages Prakriye sought to work in for this phase of Dhwanigalu. Support of the local officials, pre-existing ties with the community and the ability to target a larger population. The Child Development Project Officer (CDPO) of the H.D. Kote block that Kattemanuganahalli and Jakkahallivillages are part of, initiated a meeting with Prakriye to discuss the trainings for adolescent girls. Naganahalli was chosen because students from the three villages of Hirehalli, Heggadapura and Naganahalli attend the Naganahalli high school and this enabled the Prakriye Team to provide training to girls from those areas without additional visits to their villages. A key learning from the first phase of Dhwanigalu was the importance of working closely with front-line service providers such as Anganwadi and ASHA workers, given their reach and standing in the village community. Keeping this in mind, for the second phase, Prakriye reached out to the villages through ASHA workers, Anganwadi workers, Sanghas (woman’s collectives, with whom Prakriye has an ongoing collaboration), schools and panchayats. The list of adolescent girls was obtained from the ASHA workers and the Anganwadi workers. Prakriye also engaged their support in door to door interactions with the parents to secure their cooperation for the participation of the girls in the trainings. The trust and reputation that Prakriye built through its information centres also helped in winning over the communities for the recruitment of the girls. For example, in Jakkahalli, where the Prakriye operates an information centre out of a portion of the panchayat building, the community was quite receptive towards the programme due to their rapport with the information centre Team. The Team also engaged in group discussions with the girls to understand their expectations and needs from the training. The expectations differed from locality to locality. However, digital literacy training, awareness of sanitation, health and women’s rights were some common demands echoed by the participants across various villages. Training timings and venues that are convenient to the girls were also decided during these orientation sessions. An obstacle that Prakriye faces with regard to conducting these trainings is the rigid caste hierarchy in the villages. The adolescents are also socialised to adhere to the existing caste norms. For example, in one of the villages, during orientation, girls from upper caste families expressed reluctance to sit together with girls from lower caste communities and later they opted out of the training despite Prakriye Team reaching out to them again through ASHA/ICDS workers. 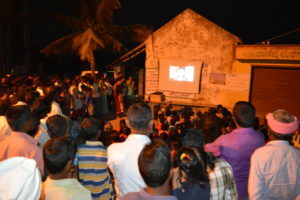 One of the strategies Prakriye adopted in phase one to ensure the cooperation of the larger community was to conduct public screenings midway during the training. In phase two also, community screenings were conducted at Kattemanuganahalli and Jakkahalli. The panchayat members, community elders and members of the general community and the Sangha members were invited to these screenings along with the girls and their parents. These sessions were an abridged version of the orientation session. The screenings took place at late evening,at a public venue, to ensure maximum attendance from the community. These sessions were challenging to organise as the concepts of women empowerment had to be presented in a manner convincing to the traditionally conservative village communities. For example, during one of the community screenings, some members of the community opined that while they are happy to send their daughters for the training, Prakriye team should ensure that the girls do not talk back to parents or disobey them after the training. The Team responded that the training focuses on improving the negotiating skills of the girls and also on enabling them to use their knowledge and skills for the advancement of themselves, family and community. It was clear that while the parents were attracted by the opportunities for digital education and capacity building, they were less enthused about the women empowerment part. Prakriye walks this tight rope by engaging with the parents regularly over the course of the training and bringing in incremental changes in their attitudes and behaviour. 1Jane Aaron & Sylvia Walby (eds) (1991) Out of the Margins: Women’s Studies in the Nineties, Falmer Press, London, p. 1.